Over the years, just about every membership marketing program has been influenced by tradition, internal politics, or database limitations. So it was interesting when I met the other day with a talented marketer who joined a group that presented him with a clean slate for membership marketing. Since almost nothing was in place, he had to build the membership marketing program from the ground up. It got me to thinking, what if I was in the same place? What if my only mandate was to grow membership based on sound marketing principles? What would my membership marketing program look like? Well here is my take on the programs that I would put in place to get membership moving. 1. Build Awareness - My first action would be to harness the web. Awareness is the first step to any purchase. And the leading source for information for most people has become the Web. So membership development begins with using search engine optimization, search engine advertising, ad networks, and social media to help people who are seeking solutions provided by an association to find me. Tracking traffic sources and the effectiveness of keywords will help me identify the people and the value that my prospects are looking to find. Anyone coming to my web site would be encouraged to register for a free association newsletter. This allows me to add the prospect to my database. 2. 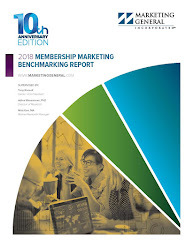 Recruit New Members - The fastest growing membership associations still rely on test-driven membership acquisition campaigns as the workhorse for gaining new members. 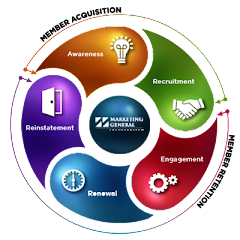 Ineffective membership recruitment is the single biggest marketing reason for declining or stagnant memberships. So my second step would be to establish regular mail and email promotions to both house and outside lists, And because these promotions will typically be the largest outreaches that the association will do, they statistically lend themselves to head-to-head market tests. Testing will tell me the best lists, offers, messages, and packages to use going forward. 3. Engage New Members - Once a new member joins my association, he or she becomes the most likely member not to renew. Almost all associations show first year members as the lowest renewing cohort. The first year is therefore referred to as the conversion year for new members. So once I get a flow on new members coming to the association, I would establish a conversion program. This type of effort is a multiple step orientation that helps the member to become engaged in the association. A sound conversion program certainly orients the member to the products, services, and opportunities provided by an association. It also should generate a second interaction with the member. This might be as simple as having the members complete a survey, but it optimally leads to a second purchase by the member of a product or attendance at a meeting. For example, sending new members a dollars off voucher for their first purchase can help them engage the organization as both a member and a customer. A member who makes a second purchase from an association before it is time for the first renewal is much more likely to renew than the non-buying member. 4. Upgrade Members - Ideally, association membership should not be a static product. Just as car companies have introductory models, family models, and luxury models to fit the changing needs and desires of buyers, an association is wise to offer members different service packages. So I would put in place an upgrade (or up-sell) program to move members from one membership tier or product package to the next higher one. It might be as simple as moving student members to a professional membership, adding additional periodicals to the membership package, or including newly published books as a part of the membership. 5. Renew Members - The days of the three-part mailed renewal series has come to an end. Instead, effective renewal systems are now built on multi-media contacts using a combination of mail, email, phone, and fax integrated with a Web renewal tool. One of the reasons that I would put an integrated program in place is because survey research reveals the startling reality of why most members fail to renew—they simply forgot! It’s not because members have become more forgetful. It is because the competition for their attention has increased. The use of multiple media and higher frequency of contact helps to break through the clutter that prevents the renewal message from getting through. 6. Reinstate Members - The most likely member to come back to an association is the one who most recently left. So a reinstatement or “win back” program is also a key practice that I would put in place. Win back lends itself to an integrated media approach. Since there is an established business relationship with the former member that hopefully includes an email opt in, mail, phone, and email are all acceptable channels to use in communicating with a former member. The messages to lapsed members will highlight the outstanding content that the member has missed in the last few issues of the magazine and upcoming networking opportunities that he or she might want to take advantage of with a renewed membership. The win back program provides an important secondary benefit. A portion of members will leave an association each year, but a well run win back program serves as a report card on the effectiveness of the renewal system. A successful program highlights a leaky renewal system. An unsuccessful win back program announces that your renewal program has captured all the members who still had a desire to stay with the association. As you can see, my focus for all the steps that I would put in place is primarily results driven. My goal in building a membership program from the ground up would be to initiate a relationship and work to retain it. Clearly there are product, services and value issues with every association that need to be addressed. These are important, but beyond the scope of what I am trying to address here. However, I find that in many cases associations provide great value. They enjoy a loyal and continuing membership. Marketing is the missing ingredient to membership success. Please share the items that you would add or subtract from my list of what your membership marketing program would look like. Excellent post, Tony. That database limitations component is so important to making all 6 of the programs you mention succeed. I hope that talented marketer you mentioned has the proper AMS to support all of these. I love this post and frequently encourage myself (and the board) to look at things from the "if we built it from the ground up, what would it look like" perspective. Where the struggle lies for a good number of us is in the ways state and local associations are hamstrung in how we can conduct membership campaigns because our dues are integrated into a larger model (think: national association *does* dues). While we reap the benefits of not having to dedicate our staff time to processing memberships, mailing renewal notices, etc. we seem to pay in the limited flexibility of such a model.